With the recent addition of the Nanday Parakeet (Nandayus nenday) and Purple Swamphen (Porphyrio porphyrio) to the ABA list (it was not too long ago that Common Myna (Acridotheres tristis) was added as well), I thought an article discussing the potentially upcoming exotic bird species from Florida to be added to the ABA area list would be relevant to the times. The current situation with exotic bird species in Florida is in a state of flux, particularly southeast Florida where the bulk of exotic bird diversity in the United States resides — and much of it “uncountable.” Some exotic bird species such as Red-whiskered Bulbul and Spot-breasted Oriole have been ABA-countable for decades, managing to maintain very small breeding populations despite the impacts of hurricanes and changes in landscaping. By comparison, other species such as Eurasian Collared-Dove spread from the Bahamas to Florida and then onward to the rest of the country within a very short time frame. Finally, there are also those species such as Egyptian Goose, Mitred Parakeet, and Yellow-chevroned Parakeet which seem poised to become new ABA-countable exotics in the future. 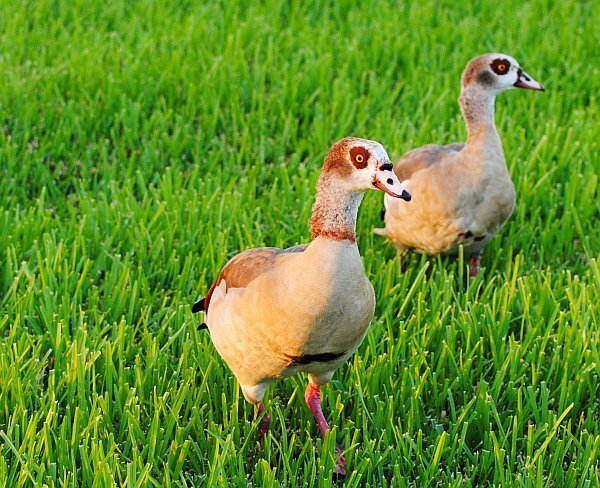 Egyptian Goose (Alopochen aegyptiacus), a common species in Africa, is my top pick for becoming the next ABA-countable exotic from Florida. These aggressive, boisterous yet attractive geese have begun building a population in Florida from a few accidental escapes from waterfowl collections (Crandon Gardens in Miami-Dade being the most famous). Within the last three to four years, this species has really begun to take off with sightings of pairs becoming regular in all sections of suburban and urban Miami-Dade, Broward, and Palm Beach counties — with some lakes and golf courses harboring a dozen or more individuals where there weren’t any just a few years ago. An exotic bird survey organized by local birders in Miami-Dade a couple years ago recorded over a hundred in that county alone in a relatively small percentage of the county, indicating that the overall population will likely be over a thousand individuals very soon if it is not already. Why has the Egyptian Goose started doing so well, and what is the potential for this species to continue to multiply and spread? First of all, the warm, subtropical landscape of southeast Florida, dotted liberally with lakes and wetlands, seems to be a perfect habitat for this species. Having evolved alongside such incredible predators in Africa such as Nile Crocodile, various big cats, large snakes, and monitor lizards, this goose would seem well equipped to handle the relatively few large predators of southeast Florida such as the American Alligator and the Bobcat. In fact, it has already been recorded well within the boundaries of Everglades National Park. It seems that the Egyptian Goose faces no hurdles as it spreads up the east coast and potentially begins to colonize the southwest coast in the near future as well. Mitred Parakeet (Aratinga mitrata), a large and lively Aratinga parakeet from Andean forests in Peru, Bolivia, and northwestern Argentina, is a familiar exotic to both birders in Miami-Dade and southern California where large populations reside. In a Florida context, the colony that has persisted at least since the 1980s near Dadeland Mall in Kendall has become an impressive sight at dawn or dusk, when a flock of three to four hundred birds amasses to roost on the high rises and office buildings in the area. 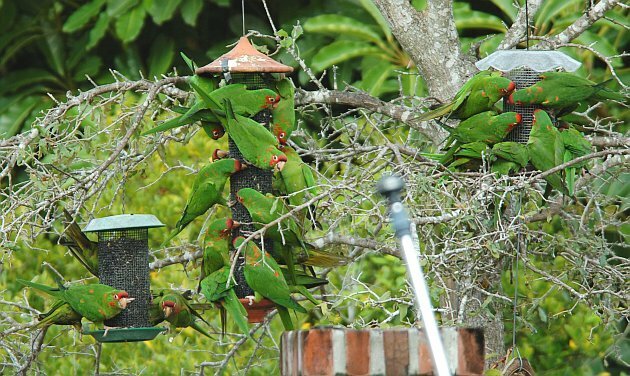 A recent survey in Miami-Dade recorded this species as the most numerous parrot species in the entire county, outnumbering all other species including Monk Parakeet by a couple hundred birds. The large population in southeast Florida coupled with the large population in southern California points towards an overall population that is potentially larger than that of the recently added Nanday Parakeet! The key to the success of these crafty, adaptable birds in suburban and urban areas is their ability to burrow in the wooden frames of buildings and other structures for nesting sites. In their native range, these birds can nest colonially at rocky cliffs — apparently, a high rise building isn’t that big of a leap. 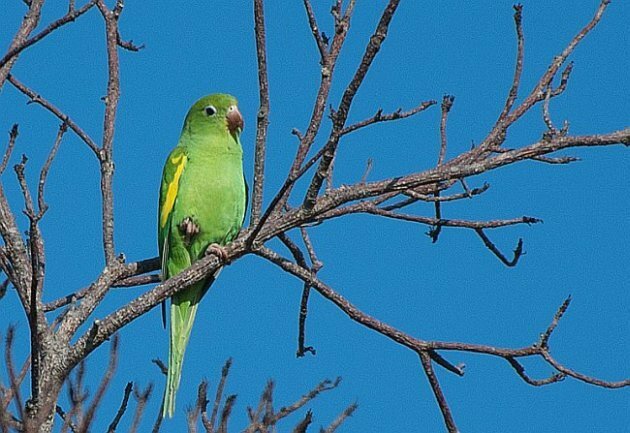 Exploiting similar food sources as many of the other parakeet found in Miami-Dade, their larger size may have allowed them to muscle out smaller species. I foresee these birds continuing to spread, gradually replacing other Aratinga species in southeast Florida. Yellow-chevroned Parakeet (Brotogeris chiriri) is the last of the three Florida exotics I believe will be ABA-countable in the future. Ranging from northeastern Brazil to the Pantanal and nearly all of lowland Bolivia, this parakeet was part of a species pair that was split that included the White-winged Parakeet, which roughly ranges in a rather narrow band along the Amazon River from lowland areas south of Iquitos in the west to the mouth of the river in the east . 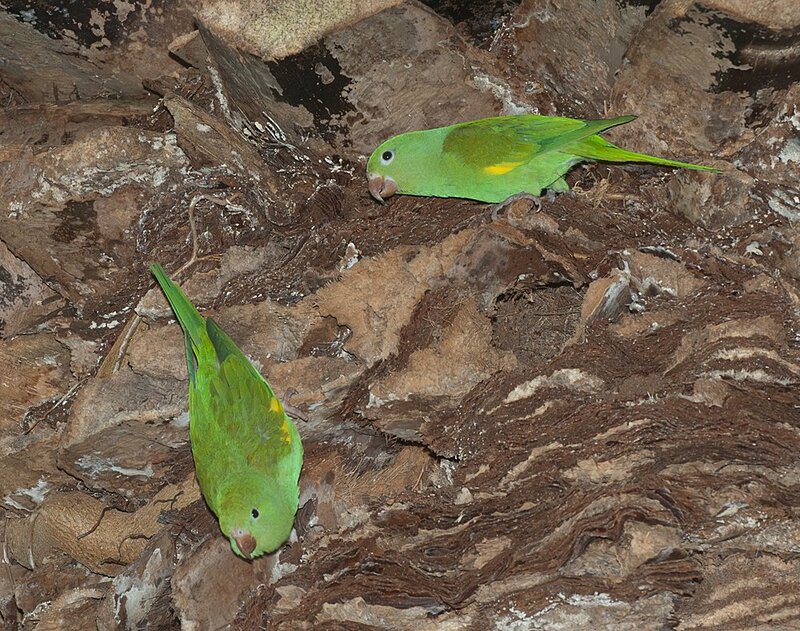 Together, both of these species were formerly known as Canary-winged Parakeet — both were formerly ABA-countable as one bird. However, when the species was split, the ABA decided to keep the White-winged Parakeet as the countable one, despite being far less numerous, while demoting Yellow-chevroned Parakeet as uncountable despite being the more numerous of the two by far. The Yellow-chevroned Parakeet makes a good contender for becoming countable for another reason as well. It is the third most numerous parrot species in Miami-Dade, behind Mitred Parakeet and Monk Parakeet, with a sizeable roost of over a hundred birds in the Dadeland Mall area alone. Which exotic bird species will the ABA decide to add to the list in the future? I believe Egyptian Goose, Mitred Parakeet, and Yellow-chevroned Parakeet are the three to watch in the coming years. If you would like to make a trip to southern Florida in search of Caribbean specialties, exotics such as those mentioned in this article, or general birding, please visit my webpage at www.ecoavian.com or contact me by email at csanchez1230@gmail.com to inquiry about my guiding services. Cool article, Carlos. What do you think about nutmeg mannikin? Haven’t seen that one yet, but I’m hoping to spot one next time I go visit my parents (I live in Pittsburgh now, grew up in Coral Gables). What’s their population status? Good summary Carlos – quick point above the Yellow-chevroned Parakeet was split from the “Canary-winged Parakeet” into 2 species White-winged & Yellow-chevroned, not as described in the caption of the final photo. White-winged was deemed established based on a single scientific paper that had been written decades ago so met the criterion for acceptance, even though IMHO Yellow-chevroneds have seemed the more plentiful bird in the past decade. Tropical Audubon Society sponsors annual “exotic” Field Trips, which will typically get over 30 introduced bird species, great fun if you ever have the opportunity. As a result there are MANY birds to choose from. In addition to the birds mentioned I’d think the following would be good candidates: Blue-crowned Conures have a substantial population in the area between St. Petersburg and Sarasota on the Gulf, & Indian Hill Mynas have been breeding commonly for 30+ years in the greater MIA area. Frank the Nutmeg Mannikin seems a different story. Much like Pin-tailed Wydah, seen here and there but never in numbers or reliably predictably, or with great frequency anywhere in Florida it seems. Canary-winged Parakeet was split into two species because of a paper written by P. William Smith I believe in the early 1990’s. When the split happened, both species were on the A.B.A. checklist, Yellow-chevroned Parakeet was later removed. When the paper was written about the Canary-winged Parakeet this included both species because they were considered the same. We did not know enough then about Canary-winged Parakeet which included both White-winged Parakeet and Yellow-chevroned Parakeet. I believe the original article that Jeff mentioned, describes the White-winged Parakeet. At that time these were the birds that were imported into south Florida and southern California in large numbers. Although perhaps near the same time period Yellow-chevroned Parakeets were also imported. White-winged Parakeet used to occur in flocks of up to about 100-birds from Homestead south of Miami to at least Ft. Lauderdale to the north. I believe that the numbers have gone down since I used to see them as a kid. Having grown up here in south Florida, I had never seen a European Starling until about the early 1970’s. I believe that the European Starling is competing for nest cavities of both the White-winged Parakeet and the Yellow-chevroned Parakeet. Another competitor is the House Sparrow. In their native range, both birds use termite mounds to dig nest cavities. In Puerto Rico I have seen nest of White-winged Parakeet in the basketball size tree termite mounds which are common there. In south Florida we have termites but not the species that builds the large mounds. The parakeets here nest in Canary Island Date Palms and related species. The birds burrow nest cavities in the softer tissue below the palm fronds. The hole that they burrow, goes up at about a 45-degree angle then goes level and then slightly down towards the back. In this nest, they usually have two young. There is a theory that Yellow-chevroned Parakeet is more aggressive than White-winged Parakeet and compete for nesting trees (one pair per tree). I was like many local birders early on and did not really care much about exotics. But, having been a bird guide for the last 18-years, I have taken notice and tried to I.D. all that is here. I currently have 30 plus species of parrots and parakeet species photographed! There are still plenty that I have not gotten photos of yet. Common Hill Myna has been breeding in small numbers since at least the 1960’s. These use to occur from Homestead to at least Ft. Lauderdale, now they seem to be from Homestead to Miami. Nutmeg Mannikin have pretty good numbers in the Florida panhandle, Mississippi and Alabama not as many in south Florida. Southern California has tons of them, they are pretty common there. A lot of the Amazon species here in the Miami area, have dwindled in numbers from what I believe is trapping for the pet trade that they escaped from. The Ft. Lauderdale area still has pretty large numbers of Red-crowned Parrots and several other species. Perhaps there is less trapping going on then in the Miami area. I have personally seen a massive roosting flock of Amazon parrots in southern California that has been estimated to be about 8,000 to 10,000 birds! Most of these are Red-crowned Parrots, Lilac-crowned Parrots with some Red-lored Parrot. You have to see a roost like this in person to really appreciate the shear number of birds and the deafening noise they create. Once it gets dark the birds don’t make a sound. Man is part of the environment in this world, we have changed the natural areas by building and planting exotic vegetation. All of this is conducive to many of these exotics for surviving. The man made environments don’t attract as many native species but do attract the exotics that are filling a niche that the natives don’t like as much. Man is not going anywhere anytime soon, the exotics are here to stay for better or for worse! Fascinating post, thanks! So interesting how cliff-dwellers have adapted to skyscrapers. Common Hill Myna is a good one. The population is definitely breeding, although it has not shown any capability of spreading beyond Miami-Dade. Their range strongly mirrors that of White-crowned Pigeon in the county, interestingly enough, although it does not occur in the tropical hardwood hammocks in Everglades National Park and remnant patches in the agricultural area just outside the main entrance. They also show seasonal movements within their small introduced range here. Nutmeg Mannikin, in my opinion, is a very strong contender. Like Egyptian Goose, it has a history of adapting and spreading in areas foreign to it from Caribbean Islands to Australia to southern California. There is a patchy (established?) population from Pensacola to coastal Mississippi that bears watching. Since these birds are small, they can easily pass under the radar. A pair of Nutmeg Mannikins successfully fledged 4-5 young in 2012 in the parking lot of my apartment complex of all things! I have noticed a small flock of mannikins every spring and summer in my complex for the past three years or so. Whatever becomes ‘countable’ or not by the ABA, all of these birds are a regular part of the daily birding experience in Miami-Dade — every outing includes a mix of ABA-countable and non-countable species. Which manakin population do you think will be the first ones to be countable, the FL or CA population? California has thousands of Nutmeg Mannikins, they should have been countable years ago for the shear number of birds. The California Records Committee is very reluctant to add any exotics. Oh crap, you have Egyptian Geese??!!? BAD, BAD news. They’ll be your next Starlings, spreading all the way to Alaska! Stop them if you can – stop them NOW!! Never mind the python. Thanks for a great resource, we’ve been photographing birds in Florida for a long time and are always inspired by the diversity.